The American economy has been staggered by financial problems that started in the housing industry and financial sectors but have now spread to most other parts of the domestic and global economy. Families are struggling as large numbers of jobs are being lost or being put at risk, as their ability to keep their houses is challenged, and as their investments lose significant value. Citizens also have to assess the consequences of the massive government bailout of the banking industry and a gigantic portfolio of federal stimulus spending. This is the most significant economic crisis in the internet era and a unique period of information seeking and communication. There have been other economic crises since the mid-1990s and the beginning of mass adoption of the internet, but none have taken place when the internet was so widely deployed or when the particulars of the crisis have been so extreme. 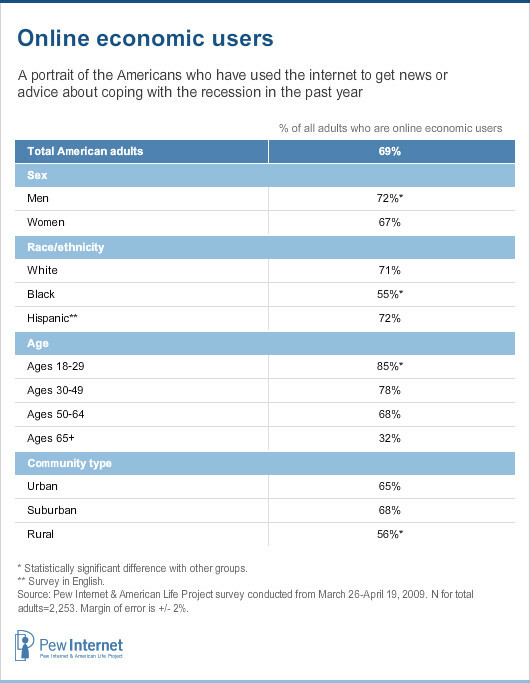 The Pew Research Center’s Internet & American Life Project wanted to examine how Americans were gathering and sharing information in their quest to cope with economic woes. The Project fielded a nationally representative phone survey between March 26 and April 19 to see how Americans were using the internet and other channels for two purposes: first, in seeking information that might help them cope with personal economic tribulations and, second, in getting material to help them understand the causes and proposed policy solutions to the crisis. In all, 2,253 adults were canvassed in the phone survey, including 561 via their cell phones. In addition to the phone survey, the Project sought extra insight and commentary from Americans in an online survey that was completed by 172 respondents. The respondents were part of a panel of volunteers who have agreed to answer questions from us in occasional surveys. They were asked some, but not all, the same questions as those in the general phone survey and a number of open-ended questions designed to gather qualitative insights into how people were using the internet in the recession. The online survey is not representative of the general population. It was conducted to gather reactions and details that could be included in this report as the “human voice” of the online community. This report will quote from the answers people gave about their searching and coping strategies as they try to make sense of the recession and figure out how to adjust to it. 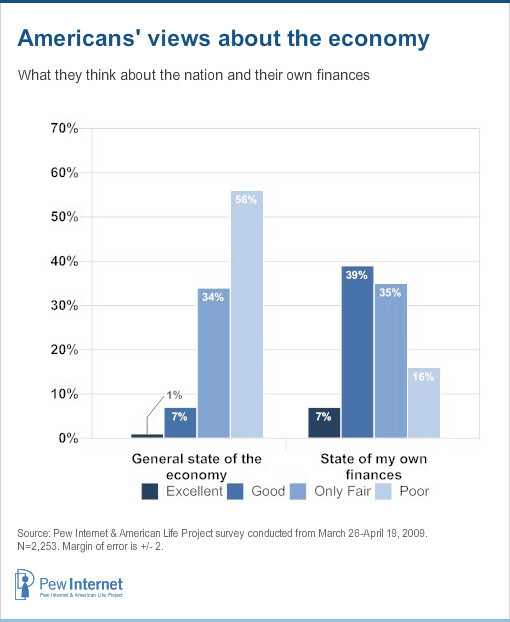 One notable trend comes in the judgments of “worried well-off” about the national economy relative to their own circumstances: 45% of those in households earning more than $75,000 say the state of the national economy is “only fair” while 73% of them describe their own circumstances are excellent or good. Another noteworthy pattern is that the employed report their own financial situation is in decent shape (52% say it is excellent or good), but they are just as likely as the unemployed or retired to say they think the overall economy is troubled. Some 55% of the employed say general economic conditions are poor and 59% of non-workers feel the same way. Furthermore, compared with non-internet users, those who use the internet were a bit more downcast about the overall economy, but somewhat more upbeat about their own economic situation. Internet users were more likely to say that the general condition of the economy was “only fair” (37% vs. 24% of non-users). Still, 43% of internet users said their personal financial situation was in good shape compared with 28% of non-users who said the same thing. These answers were likely driven by the fact that internet users are more likely than non-users to be employed and to have relatively high income and higher levels of education. 52% of American adults have suffered a major economic loss during this recession. 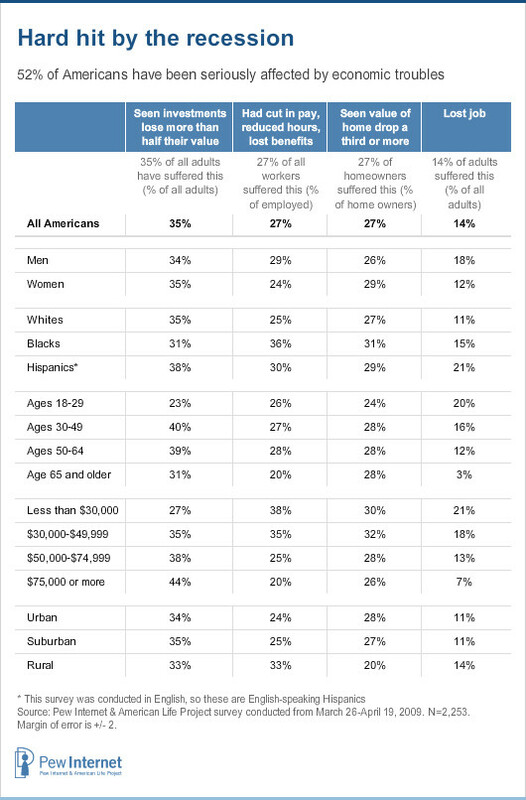 35% of Americans who say they have seen their investments lose more than half their value. 27% of those who are employed full time or part time have had their pay cut, their hours reduced or lost benefits. In this sample, 46% of adults have full-time jobs, 13% have part-time jobs, 19% are retired, and 17% are not employed for pay. 27% of homeowners who have seen the value of their home reduced by at least half. In this sample, 63% of adults are homeowners and 28% rent their housing, while 8% have other living arrangements. 14% of Americans who have been laid off or lost their jobs in the recession. A comparison of the impact of the recession on internet users and non-users shows the following: They were equally likely to report being laid off or losing a job; internet users were more likely to report investment losses and a major drop in the value of their homes; and non-internet users were more likely to report cuts in hours and benefits. Overall, 55% of internet users have been hard hit by the recession because at least one of these four major blows had befallen them and 41% of non-users had suffered such a blow. This is mostly a reflection of the fact that internet users are more likely than non-users to be home-owners and investors and to have been hit by major financial losses in those realms. The impact of the recession has been widespread and many Americans are worried about the future. That would give them some incentive to use online resources to stay on top of economic events and interact with others to share news and tips. Indeed, the majority of Americans are using the internet at least modestly for those purposes. Asked a series of questions about whether they have used the internet to get news, information, or advice about the recession, 69% of Americans say they have used the internet for these reasons. This cohort of “online economic users” amounts to 88% of the online population. A profile of online economic users shows that Americans in these groups are less likely to be in the online economic user population: women, blacks, those over age 65 (and the retired), those with less education, those who live in households with less than $30,000 income, and those in rural areas. 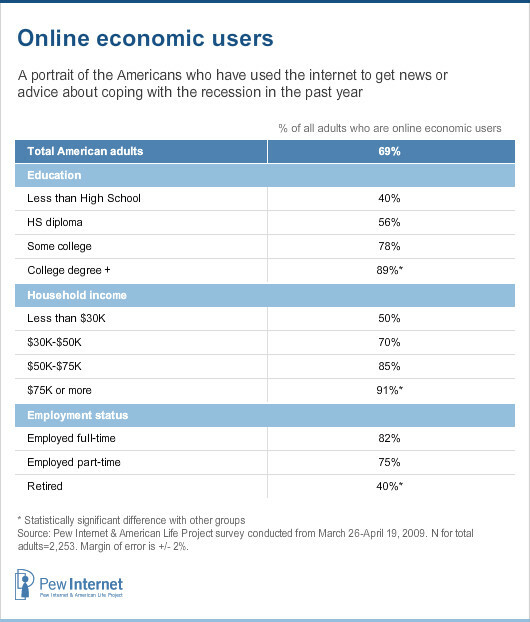 6% of online Americans use the internet several times a day to get recession-related material. 12% use the internet about once a day. 18% use it every few days. 14% use it once a week. 22% use it less often than that (the figures do not add up to 88% because this question is only one component of our definition of an online economic user). Interestingly, there is no distinct pattern of online activity by those who have been hard hit by the recession. The internet users who have suffered serious setbacks in their jobs and investments are no more likely to be frequent searchers than those who have skirted trouble. Similarly, the online Americans who have a dour sense of the national economy are no more or less likely to do recession-related online activities than those who are relatively sanguine. However, the internet users who describe their own financial situation as good are somewhat more likely to do recession-related searches daily than those who describe their situation as troubled (23% vs. 14%). In overall terms, people’s frequency of online use for economic searches is quite similar to the patterns Pew Internet has seen in other research about online Americans’ use of the internet for general news and political news. Online men are more likely than wired women to be daily users (22% vs. 13%); well-educated internet users are more likely than those with high school diplomas to be daily users (28% vs. 13%); and well-off internet users are more likely than those who are less well off to be daily users (27% of those living in households earning more than $75,000 vs. 13% of those in households earning less than $50,000). Suburban and urban internet users are online more frequently getting recession news than wired rural residents. And internet users who are employed are a bit more vigilant than those out of the workforce. In general, more and more people are handling their financial affairs, economic activity, and financially-related information searches online. Buy products: 59% of adult Americans said they have used the internet to buy products such as books, music, toys or clothing. We first asked about this activity in March 2000 and at that time 22% of adults had used the internet this way. Travel arrangements: 52% of adult Americans said they have used the internet to book travel reservations like hotels, airline tickets, or rental cars. We first asked about this activity in March 2000 and at that time 17% of adults had used the internet this way. Online banking: 45% of adult Americans said they have used the internet to do banking and bill paying. We first asked about this activity in June 2000 and at that time 8% of adults had used the internet this way. On a typical day online now, about 880% more people are doing online banking than was the case in 2000. Online classified ads: 39% of adult Americans said they have used online classified ads such as Craigslist.1 We first asked about this activity in February 2005 and at that time 24% of adults had used the internet this way. Market information: 31% of adult Americans said they have used the internet to get financial information online such as stock quotes or mortgage information. We first asked about this activity in March 2000 and at that time 20% of adults had used the internet this way. Online auctions: 21% of adult Americans said they have used the internet to participate in online auctions. We first asked about this activity in March 2000 and at that time 7% of adults had used the internet this way. Charitable donations: 15% of adult Americans said they have used the internet to make a donation to a charity. We first asked about this activity just after the September 11, 2001 terror attacks and at that time 4% of adults had used the internet this way. Stock and bond transactions: 9% of adult Americans said they have used the internet to buy and sell stocks and bonds. We first asked about this activity in March 2000 and at that time 6% of adults had used the internet this way. Clearly, people see the internet as an increasingly useful medium for conducting transactions, making purchases, and seeking information. But they have other choices, too, for all these activities and it is time to turn to a fuller understanding of the sources of information and advice people have used during the past year as they encountered more economic trials. First and foremost, I use the net, with rare exception, to access and manage all of my/our Life expenses, utility bills, banking etc., and have for many years. As more and more companies and institutions evolved to user-friendly, well-thought-out and secure “store fronts,” the more I was inclined to interact and operate at the cyber level. Financially personally, the net has been an on-demand, critical tool over the last 15 or so years. I rely on easy access to content and easy comparability of information. I constantly monitor all of my banking and expense issues. I started a while back to re-do our personal budgeting in a more granular way in MS Excel, week by week, and sticking to it. I customize all the pages I can for specific emphasis on world news-world financial news-science and discovery, among other less serious stuff. My one last wild observation: I think because it is a 7×24, space- and time-independent, flattened, truly connected world, the speed at which “the chickens come home to roost” has increased. It’s hard to deny there are problems when they are in your lap in an instant.